This is the REAL DEAL! Genuine American Alligator belly hide from wild harvested gators…….. All pictures taken in natural sunlight of the same belt…… Gator colors & hues vary as to the light & angle of the light….. This is Safari Black. Safari Black Rifle/long gun sling, made from wild American Alligators. Adjusts from 35″ to 42″. Pad is 13.5″ long and 2.5-3.25″ wide. Very nice, all American made item. Looks better in person as my flash creates a lot of glare. These gator products exponentially out wear & out last cow leather and are greatly admired by those who see them. It is an attention getter. Excellent graduation, promotion, sales incentive or Mother’s Day gift item for the sharp dressed professional. Support Southern wetlands conservation for all wildlife by purchasing this unique item. Feel free to make a REASONABLE offer on this item that’s already price below fair market wholesale. Due to my vertical operation, I can price these first class premium items way below the market. It’s already a bargain………. Many items on E-bay are mis-labeled or mis-categorized as American Alligator when they are indeed caiman from South America. Caiman is an inferior leather when compared to Genuine American Alligator. The difference is easy to spot as caiman leather has a “sand dollar” pattern throughout it’s hide whereas alligator does not. The “sand dollar” pattern is calcium deposits; ie bone. Aside from the obvious visual pattern that’s easy to spot as it stands out like a sore thumb, the calcium makes the leather difficult to work with as bone is not flexible nor can it be sewn. Through the decades, Genuine American Alligator has long held a superior reputation and price points in the worldwide exotic leather market, a place that others, notably caiman often fraudulently wish to mimic as Genuine Alligator routinely commands the pinnacle prices of leather products due to it’s availability (very limited & tightly controlled) elegance, durability and desire of a privileged clientele who simply wish to own the best. ” Add the environmentally sustainable story along with the “recovered from the brink of extinction effort and you are left with a truly unique, exciting, beautiful and interesting product. I apologize for this however there are a few countries that make it very difficult to conduct business as they do not conprehend the CITIEs Trade agreements or have not ratified them. When you’re ready for the hunt of a lifetime, please visit our website. If you seek a unique gift, please visit our selection of elegant alligator leather products. For complete information on us, gator hunting and related information, visit GatorGuides. Com. Its harvested under strict government regulation in the Southern United States via either wild harvest (trapping, public hunting, nuisance removal) or farming, all conducted under sustainable use conservation principals. Due to its finite & tight supply, popularity by fashion designers and classic appeal it will always be a high demand, high price tiered premium product; however, many consumers of alligator leather products often use the same products for the rest of their lives as the leather is extremely durable & its products classic in design & never go out of style. Often, inferior items are marketed to mimic the alligators prestigious market position. (Its against US law to claim alligator or mention alligator when its not genuine American alligator) The most common is faux or embossed leather. When either of these words are honestly used, it means the product is not gator but another material (cow leather, plastic, vinyl) printed in the pattern of gator scales in a redundant manner (The pattern repeats itself). A good quality faux or embossed item may look close to genuine alligator but its not as durable and will deteriorate long before genuine gator. Another inferior knock off found attempting to hide behind alligators elegance is the Caiman of South America. A Caiman is a crocodilian species thats very common in the wild and also common in the market place. When you compare genuine alligator next to caiman, you will notice the caiman has a sand dollar pattern in the larger scales found on its belly. These sand dollar ridges are composed of calcium deposits, the same material bone is composed of. These calcium deposits, depending on their density, are not leather but bone. As such, they are not as pliable as alligator leather or the flank leather found on a caiman. Additionally, since the ridges are bone, they do not absorb the chemicals need to tan or color the material, so they always appear whitish to the eye. Africa, Indonesia and Australia all are producing farm and wild crocodile. Genuine crocodile leather is close in appeal and quality to alligator leather however; its sources may not be as regulated. When compared side by side, the larger belly scales of alligator leather will have a crows feet look at one end of the scale. On croc, they dont have the lines of the crows feet but have a round, single dot instead. This is the easiest method to determine the type of animal that produced the product. With alligator hides, there are many grades and quality levels of the materials used in products. Green alligator hides are graded by the holes produced by either the gators life experiences (fighting, sliding over rocks) or the skinning process. Scars from its lifes experiences and buttons due to its age or diet will detract from its grade & value. A button is a calcium deposit in its scale similar to those found in the caiman. Large older, wild gators often have from a few to many buttons. Later in the process, after the hide is cured, tanned & dyed, it is often shaved thinner in order to make it slightly easier to work with. This process will also produce holes in the hide, further devaluing the hide and forcing it to be used in smaller products such as wallets or shoes rather than purses, briefcases or furniture. Alligator leather is an extremely tough leather to work with. It will often destroy needles, machines and the like that are normally used in conjunction with other leathers, often limiting the number of craftsmen, designers and artists willing to work with it thus adding to the final cost of products. Another drawback in working with alligator is correctly and intelligently utilizing the beauty and appeal of its natural scale pattern. Similar to a diamond, each hide has its own unique scale pattern which must be considered before the hide is cut into patterns for products. Failure to maximize or making the wrong cuts can ruin the hide or result in less valuable products being produced from a superior hide. Think along the lines of a cow. If the butcher uses a prime Angus beef cow for strictly hamburger because an amateur made the lowest value cuts rather than higher profit cuts as prime rib, filets and the like, the market value of the finished product has been greatly reduced. Once the alligator hide is tanned, it can be dyed or colored. The classic colors are black, brown and peanut. Depending on the market, other colors may be in demand but usually they come and go (as in fads) but leave the classics as a consistent base. Classic finishes are safari or matte and high gloss. With the tanning process, each and every scale has a unique quality and thickness, thus producing a uniform tan or color set across the hide is not an easy feat to accomplish. For the safari or matte finishes, uniformity is more easily achieved. For a uniform high gloss finish, a higher grade hide is often needed. In the real world, the high gloss finish is usually used in the manufacture of high fashion, high end items with the matte or safari finish most often associated with daily wear casual items. A common, lower priced product found on the market consisting of genuine alligator is the horn back hide or cut. Normally, the horn back is discarded since it consists of osteoderms or scutes. These scutes are bones that plate the back of alligators & crocodiles and are part of their ancient armor system that protects them. As discussed above concerning the calcium in the skin of the caiman, these scutes do not tan very well as the bone does not absorb dyes. While many attractive products such as belts, boots, wallets, shoes and purses may be made from the horn back cut, they must come from small alligators due to their lack of elasticity and are not considered to be within the family of the Classic products produced from alligator leather. While horn back products have a market following, its most often associated with the independent, individual American biker grade group of products. With alligator hides, the quality level affects the final products price. While smaller quality items may be produced from greatly flawed hides, larger items such as purses, briefcases, luggage and furniture must be produced from the less common, more expensive higher grade hides. (Larger hides with fewer holes, scars or buttons) This results in the larger the product, the higher grade hide that must be used in its manufacture thus the higher the retail price and the more limited is the products availability. I hope this assists with understanding the pricing structure and market availability of genuine American alligator verses the inferior wanna bes and the lesser grades of alligator hides. He also owns HighClassic Alligator Leather Products. Prior to his involvement in the alligator industry, Capt Walters spent decades in the beverage alcohol industry as a sales representative, wine consultant and sales manager. He is as well versed and competent in both the swamp to produce a gator and the jungle otherwise known as the market to sell a finished, high end product. Our motto: Support American Craftsmen! The item “American Wild Alligator Rifle shotgun Shoulder Sling Strap gator leather FB4″ is in sale since Tuesday, April 2, 2019. This item is in the category “Sporting Goods\Hunting\Range & Shooting Accessories\Slings & Swivels”. 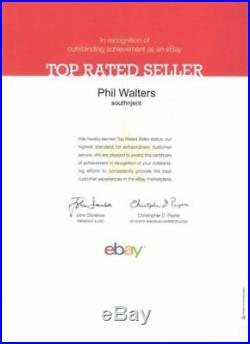 The seller is “southnjent” and is located in Tampa, Florida. This item can be shipped to United States. This is the REAL DEAL! Genuine American Alligator belly hide from wild harvested gators…….. All pictures taken in natural sunlight of the same belt…… Gator colors & hues vary as to the light & angle of the light….. This is Safari Black. Safari Black Rifle/long gun sling, made from wild American Alligators. Adjusts from 32″ to 36″. Pad is 14″ long and 3″ wide & tapers. Very nice, all American made item. Looks better in person as my flash creates a lot of glare. These gator products exponentially out wear & out last cow leather and are greatly admired by those who see them. It is an attention getter. Excellent graduation, promotion, sales incentive or Mother’s Day gift item for the sharp dressed professional. Support Southern wetlands conservation for all wildlife by purchasing this unique item. Feel free to make a REASONABLE offer on this item that’s already price below fair market wholesale. Due to my vertical operation, I can price these first class premium items way below the market. It’s already a bargain………. Many items on E-bay are mis-labeled or mis-categorized as American Alligator when they are indeed caiman from South America. Caiman is an inferior leather when compared to Genuine American Alligator. The difference is easy to spot as caiman leather has a “sand dollar” pattern throughout it’s hide whereas alligator does not. The “sand dollar” pattern is calcium deposits; ie bone. Aside from the obvious visual pattern that’s easy to spot as it stands out like a sore thumb, the calcium makes the leather difficult to work with as bone is not flexible nor can it be sewn. Through the decades, Genuine American Alligator has long held a superior reputation and price points in the worldwide exotic leather market, a place that others, notably caiman often fraudulently wish to mimic as Genuine Alligator routinely commands the pinnacle prices of leather products due to it’s availability (very limited & tightly controlled) elegance, durability and desire of a privileged clientele who simply wish to own the best. ” Add the environmentally sustainable story along with the “recovered from the brink of extinction effort and you are left with a truly unique, exciting, beautiful and interesting product. I apologize for this however there are a few countries that make it very difficult to conduct business as they do not conprehend the CITIEs Trade agreements or have not ratified them. When you’re ready for the hunt of a lifetime, please visit our website. If you seek a unique gift, please visit our selection of elegant alligator leather products. 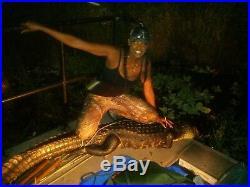 For complete information on us, gator hunting and related information, visit GatorGuides. Com. Its harvested under strict government regulation in the Southern United States via either wild harvest (trapping, public hunting, nuisance removal) or farming, all conducted under sustainable use conservation principals. Due to its finite & tight supply, popularity by fashion designers and classic appeal it will always be a high demand, high price tiered premium product; however, many consumers of alligator leather products often use the same products for the rest of their lives as the leather is extremely durable & its products classic in design & never go out of style. Often, inferior items are marketed to mimic the alligators prestigious market position. (Its against US law to claim alligator or mention alligator when its not genuine American alligator) The most common is faux or embossed leather. When either of these words are honestly used, it means the product is not gator but another material (cow leather, plastic, vinyl) printed in the pattern of gator scales in a redundant manner (The pattern repeats itself). A good quality faux or embossed item may look close to genuine alligator but its not as durable and will deteriorate long before genuine gator. Another inferior knock off found attempting to hide behind alligators elegance is the Caiman of South America. A Caiman is a crocodilian species thats very common in the wild and also common in the market place. When you compare genuine alligator next to caiman, you will notice the caiman has a sand dollar pattern in the larger scales found on its belly. These sand dollar ridges are composed of calcium deposits, the same material bone is composed of. These calcium deposits, depending on their density, are not leather but bone. As such, they are not as pliable as alligator leather or the flank leather found on a caiman. Additionally, since the ridges are bone, they do not absorb the chemicals need to tan or color the material, so they always appear whitish to the eye. Africa, Indonesia and Australia all are producing farm and wild crocodile. Genuine crocodile leather is close in appeal and quality to alligator leather however; its sources may not be as regulated. When compared side by side, the larger belly scales of alligator leather will have a crows feet look at one end of the scale. On croc, they dont have the lines of the crows feet but have a round, single dot instead. This is the easiest method to determine the type of animal that produced the product. With alligator hides, there are many grades and quality levels of the materials used in products. Green alligator hides are graded by the holes produced by either the gators life experiences (fighting, sliding over rocks) or the skinning process. Scars from its lifes experiences and buttons due to its age or diet will detract from its grade & value. A button is a calcium deposit in its scale similar to those found in the caiman. Large older, wild gators often have from a few to many buttons. Later in the process, after the hide is cured, tanned & dyed, it is often shaved thinner in order to make it slightly easier to work with. This process will also produce holes in the hide, further devaluing the hide and forcing it to be used in smaller products such as wallets or shoes rather than purses, briefcases or furniture. Alligator leather is an extremely tough leather to work with. It will often destroy needles, machines and the like that are normally used in conjunction with other leathers, often limiting the number of craftsmen, designers and artists willing to work with it thus adding to the final cost of products. Another drawback in working with alligator is correctly and intelligently utilizing the beauty and appeal of its natural scale pattern. Similar to a diamond, each hide has its own unique scale pattern which must be considered before the hide is cut into patterns for products. Failure to maximize or making the wrong cuts can ruin the hide or result in less valuable products being produced from a superior hide. Think along the lines of a cow. If the butcher uses a prime Angus beef cow for strictly hamburger because an amateur made the lowest value cuts rather than higher profit cuts as prime rib, filets and the like, the market value of the finished product has been greatly reduced. Once the alligator hide is tanned, it can be dyed or colored. The classic colors are black, brown and peanut. Depending on the market, other colors may be in demand but usually they come and go (as in fads) but leave the classics as a consistent base. Classic finishes are safari or matte and high gloss. With the tanning process, each and every scale has a unique quality and thickness, thus producing a uniform tan or color set across the hide is not an easy feat to accomplish. For the safari or matte finishes, uniformity is more easily achieved. For a uniform high gloss finish, a higher grade hide is often needed. In the real world, the high gloss finish is usually used in the manufacture of high fashion, high end items with the matte or safari finish most often associated with daily wear casual items. A common, lower priced product found on the market consisting of genuine alligator is the horn back hide or cut. Normally, the horn back is discarded since it consists of osteoderms or scutes. These scutes are bones that plate the back of alligators & crocodiles and are part of their ancient armor system that protects them. As discussed above concerning the calcium in the skin of the caiman, these scutes do not tan very well as the bone does not absorb dyes. While many attractive products such as belts, boots, wallets, shoes and purses may be made from the horn back cut, they must come from small alligators due to their lack of elasticity and are not considered to be within the family of the Classic products produced from alligator leather. While horn back products have a market following, its most often associated with the independent, individual American biker grade group of products. With alligator hides, the quality level affects the final products price. While smaller quality items may be produced from greatly flawed hides, larger items such as purses, briefcases, luggage and furniture must be produced from the less common, more expensive higher grade hides. (Larger hides with fewer holes, scars or buttons) This results in the larger the product, the higher grade hide that must be used in its manufacture thus the higher the retail price and the more limited is the products availability. I hope this assists with understanding the pricing structure and market availability of genuine American alligator verses the inferior wanna bes and the lesser grades of alligator hides. He also owns HighClassic Alligator Leather Products. Prior to his involvement in the alligator industry, Capt Walters spent decades in the beverage alcohol industry as a sales representative, wine consultant and sales manager. 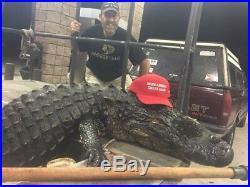 He is as well versed and competent in both the swamp to produce a gator and the jungle otherwise known as the market to sell a finished, high end product. Our motto: Support American Craftsmen! The item “American Wild Alligator Rifle shotgun Shoulder Sling Strap gator leather FB6″ is in sale since Tuesday, April 2, 2019. This item is in the category “Sporting Goods\Hunting\Range & Shooting Accessories\Slings & Swivels”. The seller is “southnjent” and is located in Tampa, Florida. This item can be shipped to United States.